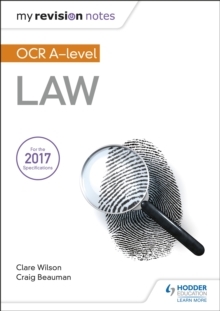 Exam board: OCRLevel: A-levelSubject: LawFirst teaching: September 2017First exams: Summer 2018Target success in OCR A Level with this proven formula for effective, structured revision; key content coverage is combined with exam-style questions, revision tasks and practical tips to create a revision guide that students can rely on to review, strengthen and test their knowledge. With My Revision Notes every student can:* Plan and manage a successful revision programme using the topic-by-topic planner. * Enjoy an interactive approach to revision, with clear topic summaries that consolidate knowledge and related activities that put the content into context. * Build, practise and enhance exam skills by progressing through revision tasks and Test Yourself activities. 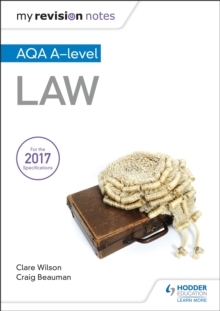 * Improve exam technique through exam-style questions and sample answers with commentary from expert authors and teachers. * Get exam ready with extra quick quizzes and answers to the activities available online.